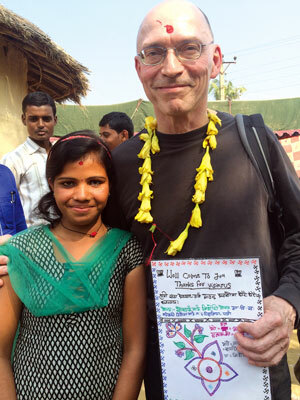 GATE TO THE FUTURE: An illiterate school girl in Parsa who learnt how to read and write as a result of UNICEF’s Girls Access To Education program (GATE) supported by Stefan Findel and his wife, Susan. The Findels are the largest individual donors to UNICEF. 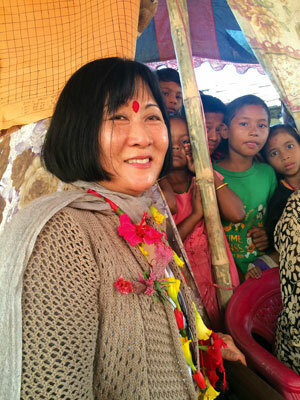 When Susan Findel was 10 and growing up in an orphanage in Korea she got a vaccination provided by UNICEF. In the past 20 years, Susan and her German husband, Stefan, have given away $26 million to UNICEF’s work to educate children in five countries around the world, including Nepal. For years, the Findels were anonymous donors, but UNICEF convinced them that by coming out they could inspire others to also help underprivileged children around the world. The couple try to make frequent field trips to look at the work they fund, and had a meeting in Kathmandu this week of their partners from the countries they support. The Findels worked with UNICEF to select the five countries, and regions within them that were the most under-served. In Nepal, their initiative to ensure equality in education is being implemented in Parsa, Achham and four other districts. Despite progress in literacy, especially among girls, there are over 1 million children in Nepal who do not go to school. Even in districts where there is high enrollment, nearly half the children (mostly girls) drop out before Grade 5. Literacy among children of Dalits and other sidelined groups is much lower than the national average. “Illiteracy and caste discrimination mean isolation and relegate children to insignificance, I know what it feels like to be an outcast,” says Susan Findel who experienced stigmatisation and ostracisation first-hand when she was required to wear the colour-coded white handkerchief of an orphan. The Findels have seen teenage girls in the West Point slum of Monrovia who used to be so shy they couldn’t even speak completely transformed after UNICEF’s girls empowerment program. They have observed similar changes in adolescent girls in Achham and Parsa (see picture). Ann Putnam Marks of UNICEF USA, who accompanied the Findels on their field trip to Nepal, says it is very unique to have philanthropists like them. “It is rare to see donors who are so committed to seeing things first-hand, and who provide support for long-term initiatives like education,” says Marks. Indeed, most individual donors tend to prefer assistance for emergency relief because it is more visible, and many also want credit for it. The Findels say they chose UNICEF precisely because it works at all levels, doesn’t abandon a country when crises like ebola in Liberia hit, and invests in sustainable, long-term projects and hands them over to the government.